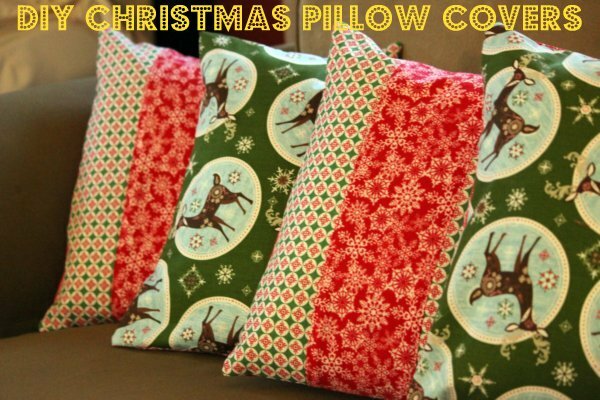 For the last couple of Christmases, I've had the notion to make festive pillow covers for our couches. But having the notion doesn't always, and in my case of late, rarely equals the follow through. But I decided it was time to pull out the sewing machine again for the first time since last winter or spring. I love to sew, but having the time or energy just hasn't been a reality for the last several months. Our normal couch pillows were in sad disrepair, so I decided to just buy new pillow forms (18 x 18 in.) on sale and craft Christmas covers, then make new all-year round covers after the holidays. They are so simple to make. If you can sew in line for 18 - 20 in. straight, you're golden. I use the pocket method, with two pieces that overlap on the back side so you can slip the pillow in and out with no tricky zippers or buttons to install. I'm all about ease, while having a finished product that still looks professional. To make four - 18 in. pillows, I bought 3/4 yd. of 4 different fabrics. (the pillow backs each have a different fabric, because I like to mix things up) If you are wanting to make four pillows all the same on the front and back, you'd need 3 yards of one fabric. Hooray for 50 - 60% off sales! To cut the fabric to size, I get really scientific here, and lay my pillow form on a corner of one piece of fabric (keep it folded in half, so you are cutting two at once) smoosh your pillow form (or current couch pillows) down and cut around it leaving a 1 in. border. I place it on the corner, so I don't have to cut as much, and I can be sure that at least two sides will end up straight! Then you can use one of the squares you've cut as your pattern for the rest of the pillow fronts. Now, don't let the overlapping back scare you. 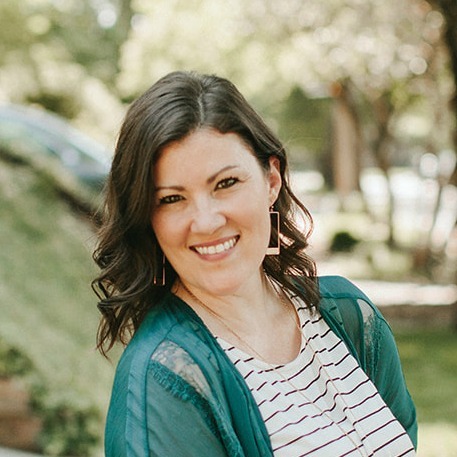 You'll need to cut an oblong piece that is the same height as one of your new pattern pieces so that you can cut them apart later and still have them match up into a square. Cut the oblong piece into two pieces, don't worry about them being even. In fact, I like mine to be off set a bit. It doesn't matter at all how much you have them overlap, but I generally made them overlap by 4 inches or so. The first step in sewing is to sew the seams on one of the longer sides of the two overlapping pieces. Fold the edge over 1 cm, and iron all the way down. Then fold and iron a second time folding your newly ironed seam over again. Then sew straight across the ironed seam. Complete this step on all overlapping pieces. See? These are really easy. Now you'll sew one more time and you're done with a pillow! Lay one of your front pieces down right side up, then overlap your ironed/sewn overlap pieces right side down, making sure all edges line up with your front piece, pin together and sew around the square with a 3/4 in. seam allowance. I apologize if the directions are not clear. Feel free to email me if you need help! I was going to take pictures and make an official tutorial as I went along, but my time was fleeting as I finished these during one of Emmalie's naps last weekend. Let me know if you give it a whirl, I'd love to see your finished product! 1 comment on "Christmas on my couch"
OOOooohhhh!!!!! I LOVE pillows!!! Too fun to get Christmas on your couch even if Christmas isn't around. The more pillows the better.